Sophomore triplets Ben, Anthony and Mike Scarpa discuss how playing on the same team affects themselves and the team. After former head coach Mike Welch retired after 23 seasons, the football team will be lead by a new coaching staff for the 2017 season. Gary Bucci ’76, returns to his alma mater to tackle being the new assistant football coach for the 2017 football season. The Ithaca College football team welcomes Gary Bucci as the new assistant coach for the 2017 season. 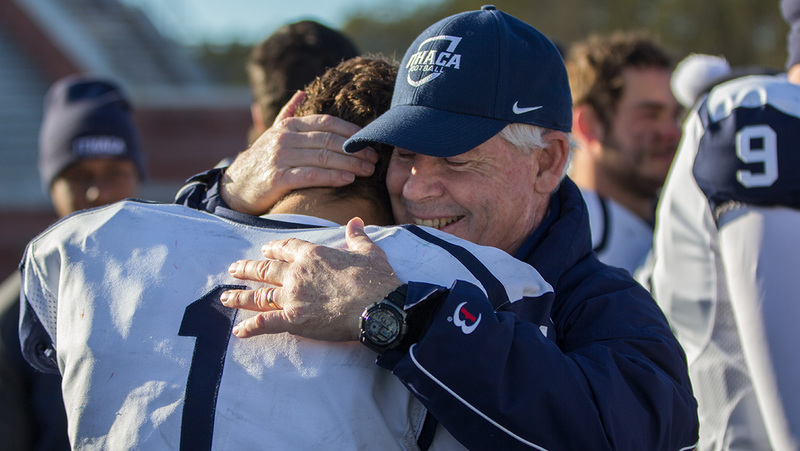 Mike Toerper, who formerly coached at the Johns Hopkins University, has joined the Ithaca College football coaching staff as defensive coordinator. Michael Toerper, defensive backs and special teams coordinator at Johns Hopkins University, will be the new football defensive coordinator. For the first time in 23 years, Ithaca College has a new football head coach leading them. Dan Swanstrom, the new head coach of the Ithaca College football team, announced he will be evaluating the whole program during a news conference Dec. 13. During his 23 years as head coach, Welch has accumulated a 169–78 overall record with eight NCAA playoff appearances. The Ithaca College Bombers take on the SUNY Cortland Red Dragons in the 58th annual Cortaca Jug game. SUNY Cortland defeated the Bombers in the last game of Mike Welch’s career 28–16 Nov. 12 in Cortland.